2015 was a fun year for Call for Participants. 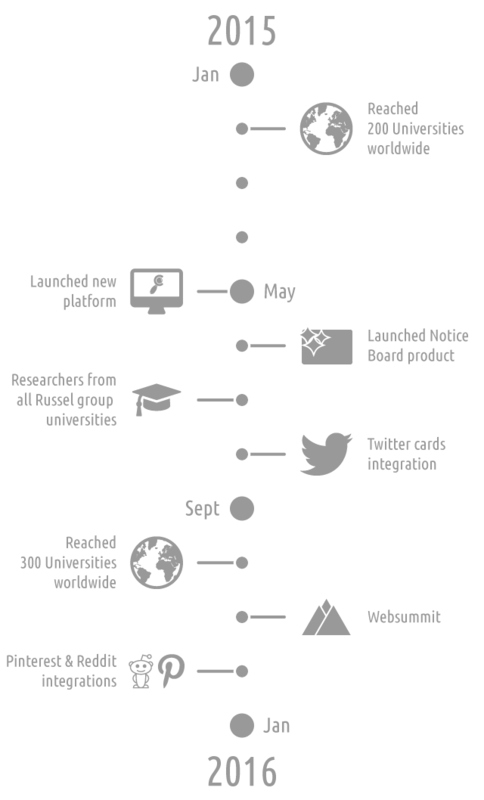 We introduced many new features and reached several milestones on our journey to bringing academic research to the world. Let's take a quick look back at what we did and take a look at what to expect from 2016. One of the biggest moments of the year for us was announcing the slimmed down new version of our platform, which we felt really made a difference in the user experience and made it easier to navigate the platform. The several integrations like Twitter cards, Pinterest, and Reddit made research more accessible and easier to find for participants. We have seen the platform grow after each integration, allowing us to reach new milestones almost every month. Showcasing our product at the Dublin Web Summit was also particular highlight for us. Participants enjoyed a plethora interesting research to discover with over a thousand research studies created over the year. And your participation was now without rewards. Over £152,750 was paid out over the year in cash and vouchers alone*, not to mention the countless cakes, bisquits, personal feedback and other goodies supplied. Somewhat expectedly, "psychology" dominated the researcher-provided keywords, but generally there was a interesting mix of studies and academic disciplines. 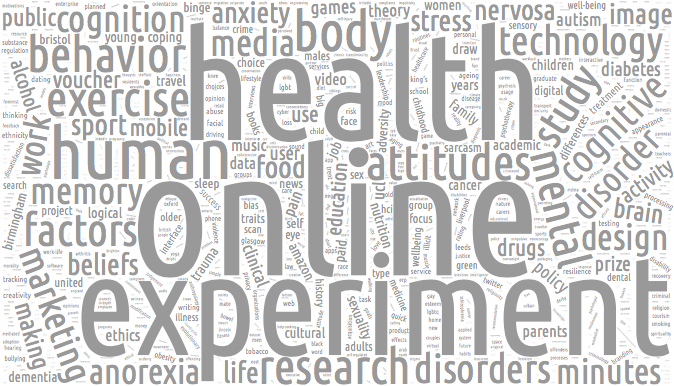 Wordcloud of popular researcher provided keywords in 2015, omitting the most popular - psychology. We are continuing to bring out new features for researchers saving them time and money. First of which you have already seen. We will be bringing out new features for participants to make keeping in touch and taking part in research easier. We will be expanding our product line with new products aimed at universities, departments, and other organisations. We will continue working closely with our partners Jisc to better embed the service in the higher education sector. We will be expanding our media and other partnership activities to allow more people to bring great research opportunities to more people. If you have any suggestions for what you would like to see from Call for Participants, please let us know here if you are a participant, or here if you are a researcher. * Data measured from 1 Jan 2015 to 31 Dec 2015. Not accounting for any undelivered benefit by researchers or participants who failed to complete the research.